John Stuart Mill . . . Poet? That John Stuart Mill valued the poetry of the British Romantics, preeminently that of William Wordsworth, is amply attested by his famous account of his own mental breakdown and recovery within his Autobiography (CW 1.148-63). That Mill appreciated the early promise of a later skillful adapter of Romantic poetics, one who would ultimately succeed Wordsworth in his position as Poet Laureate, is evident from his 1835 review essay of “Tennyson’s Poems” (CW 1.395-418). That Mill himself imbibed and helped to articulate the poetic principles shared by Wordsworth and Tennyson becomes clear in his still-anthologized distinction between the “heard” and the “overheard” from “What Is Poetry?”—itself first published in January 1833 in the Monthly Examiner and later republished as the opening section of his longer “Thoughts on Poetry and its Varieties” in Dissertations and Discussions (1859) (CW 1.343-53). That Mill, as an adult, ever attempted to put these principles into practice by writing his own poetry is nowhere in evidence in his published works (in his Autobiography, Mill does recount that “writing verses . . . was one of the most disagreeable” facets of his childhood education, retrospectively judging that the “verses I wrote were of course the merest rubbish, nor did I ever attain any facility of versification” [CW 1.17-19]). 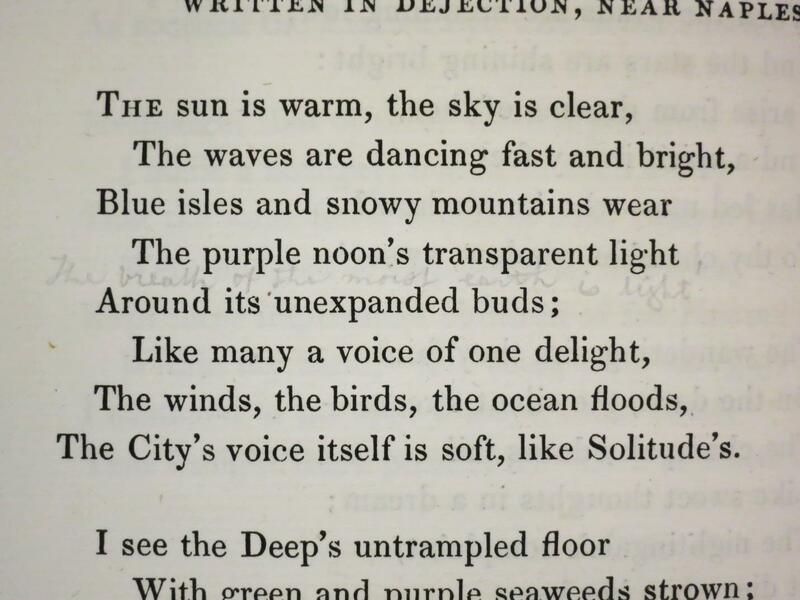 It is difficult to discern whether Mill intended for his “The breath of the moist earth is light!” to replace, supplement, or merely reflect upon Shelley’s original “The purple moon’s transparent light.” It is also impossible to reconstruct the spirit in which Mill wrote his own line. With only six pages of Posthumous Poems containing any sort of marginalia, there is simply insufficient evidence within this particular book to speculate about intent. What is obvious is that Mill has adopted Shelley’s iambic meter and appropriated Shelley’s end-rhyme, even as he has ignored the syntax of Shelley’s poetic sentence. Also readily apparent is the relative amateurishness of Mill’s line, which is built entirely of monosyllables, one wasted on a preposition and another on a conjugation of “to be” that neglects to achieve the taut anaphora of Shelley’s opening line; and which includes an adjective, “moist,” that jarringly shifts attention from the play of light upon the landscape to the emission of water from it. As an example of original composition, then, Mill’s handwritten line seems eminently forgettable. As a tangible sign of Mill’s engagement with second-generation Romantic poetry, however, one that reveals Mill taking the time to appreciate the form of Shelley’s line by reproducing it, this annotation seems worth noting. Moreover, although Mill’s annotation is impossible to date precisely, it is tempting to imagine the young John Stuart attempting to come to terms with what he would later term the “crisis in my mental history” by either reading or recalling his reading of Shelley’s “Stanzas,” and seeking from that experience the solace for his own dejection, not in nature directly, as occurs for Shelley’s poetic speaker, but in nature “overheard” thanks to Mary Shelley’s posthumous publication of the poem.